(Nanowerk News) An electron microscope with glasses that correct the spherical aberration of the lens in order to achieve even higher resolution is currently being assembled at the Electron Microscopy Centre (EMEZ) at ETH Zurich. It is the first high-tech electron microscope of its kind in Switzerland. 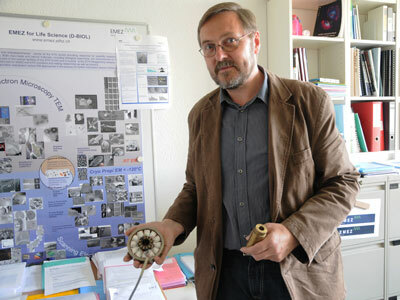 Roger Wepf, Director of EMEZ, explains how the spectacles give researchers an even better insight into matter. Mr. Wepf, EMEZ already has more than eleven different types of electron microscopes. You have now received another new instrument at EMEZ. What is this electron microscope capable of doing that the others are not? The corrected electron microscope has a kind of “glasses” that correct the spherical aberration of the lens. As a result we achieve much higher resolution and better chemical analysis. Without them the refraction of the electron beams in the centre of the lens is different to that at the edges and does not focus them to a point. As a result the rays do not converge at the focus of the lens. This leads to a confusion disk instead of a focused point and thus to image blurring, i.e. the structures are not sharply imaged. With the corrector we achieve a resolution in the sub-atomic range down to 78 picometres (0.078 nanometres) – with a conventional high-resolution electron microscope it is 180 to 200 picometres. This very high resolution corresponds to an images precision better than one angstrom, i.e. less than 100 picometres. That is smaller than the diameter of an atom and enables us to resolve atoms accurately without additional optical processes or computational reconstruction. How is this kind of corrector constructed? The corrector consists of a column about 50 centimetres high with four ring-shaped elements, connected in series, in which 12 coils of copper wires are symmetrically arranged. Tubular transfer lenses are interposed between them to prevent the magnetic fields to mutually interfere. The corrector is installed in the beam path of a transmission electron microscope or scanning transmission electron microscope. How does this device affect the electron beam? The corrector reshapes the electron beam – if you begin with a rotationally symmetrical electron beam – in such a way that it is carried almost perfectly through the lens and emerges again as a circular beam. Thus the beam strikes the focus of the lens perfectly. For this purpose a computer program controls the coils that adjust and deflect the electron beam. For which investigations are the corrected electron microscope’s special capabilities important? Wherever there is a need to measure, for example, the element distribution and density differences, e.g. in a crystal, in the range of less than a tenth of a nanometre, and to distinguish easily between light and heavy atoms. That is important, for example, in semiconductor research and quantum optics. Wouldn’t it be a good idea to equip every electron microscope with this kind of correction as a standard? The correction is only necessary where single atoms or atomic columns need to be seen and analysed. Many users are already happy with the 500 to 1000 picometres resolution of a classical electron microscope. Direct imaging on an atomic scale is impossible in biology as a rule because the samples are not rigid enough, but are flexible and are shifted by the preparation. Furthermore, these samples consist mainly of light atoms that can be shot out and vaporised at 200 kilovolts, or yield almost no signal. It is the first electron microscope of its kind in Switzerland. Is that because it is needed only for specific research purposes or due to the costs? Until recently, these instruments were too expensive, costing 4.5 to 6.5 million Swiss francs. Since Hitachi opened up a market with scientific instruments, prices have come under pressure and the instruments have become more affordable. Naturally, however, a suitable environment is also needed for this kind of purchase, e.g. to pre-select suitable samples: a basis platform with a variety of instruments – from which our new instrument stands out like a “beacon” – and people who are able to operate them. The EMEZ’s interdisciplinary platform is especially suitable for this, because there is also a sufficiently large demand. For what research purposes will it be used at ETH Zurich and who will work with it? The quantum optics scientists need this kind of electron microscope to see how their quantum objects (quantum wells and dots) are constructed and how the elements are distributed within them. It is needed in semiconductor technology to verify the layer structure and the atomic configuration at the interfaces between different semiconductor layers. In nanotechnology it enables the visualisation of how the nano-particles are constructed or how the materials scientist’s composite materials are structured on an atomic scale. In biology it makes sense to use the instrument when the surface of isolated macromolecules needs to be reconstructed or to simultaneously image and determine the molecular weights of large macromolecular complexes that a mass spectrometer cannot record individually. Will the instrument also be available for guest users? We think it is important that the new instrument can be used throughout Switzerland. That’s how we want to show that such “beacon instruments” are not needed in every institution, but that these kinds of purchases can be coordinated throughout Switzerland and thus be used efficiently. It would be desirable to build up a nationwide user network for these kinds of high-tech instruments in the future. Do users of the new electron microscope need special training? Yes, they must already be experienced in using one of the basic instruments. The new instrument replaces a 23-year-old transmission electron microscope that was used by 35 researchers. 25 of them need the capabilities of the new instrument and will be trained in its use. They should be able to work with it in six months at the latest. Have you already tested the microscope? What are the initial experiences? The microscope had already been tested by the manufacturer Hitachi in Japan, before it was delivered. The functional test was a pre-condition for us, since possible problems would have resulted in prolonged discussions about the cause and long-distance repairs would take much too long. Unfortunately, after assembly it turned out that two of the electron microscope’s six detectors supplied by companies in the US were faulty. That’s why there are now delays of two to three weeks. Correctors of this kind exist for transmission electron microscopes (imaging correctors) and scanning transmission electron microscopes (probe correctors). The latter has now been purchased at EMEZ for about 3.2 million Swiss francs. The new instrument scans a focussed beam of electrons over the sample; the signal is measured at the same time by various detectors below and above the sample, in order to analyse the object and to display it. In the second half of the nineties scientists from Darmstadt, Heidelberg and Jülich discovered how to construct the corrector, which had been sought for decades. One of them, the physicist Maximilian Haider, will be guest speaker on 4 December at the inaugural celebration of Switzerland’s first corrected scanning transmission electron microscope at ETH Zurich.